What do you think of when you hear the term “health care”? There are so many facets to this term that each person’s answer could be vastly different given their personal experience and involvement in health care. So much goes into health care that it has evolved to become an extensive web of intricate nuances and complexities, and that web continues to grow every day. 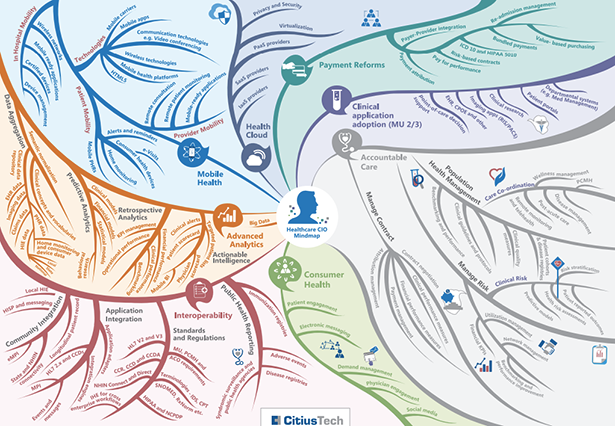 This map, which illustrates the many different elements of health care from a CIO’s perspective, shows just how complex it is. The Mobile Health section in blue lists out much of what we write about, like hospital mobility, mobile apps, electronic visits, and communication, in the charge capture blog. Other sections are just as relevant with Consumer Health (electronic messaging), Interoperability (application integration), and Payment Reforms (ICD-10 and HIPAA).